Eidelblog: "Christians and Jews rampage across Western countries"
Defending individual liberty against the tyranny of government. Truth, justice and the American way: liberty without compromise. "Christians and Jews rampage across Western countries"
If you've been following the news for the last several days, you must have heard about a group of Irish Catholics, wielding assault rifles, taking over the Mansion House in Dublin. They said they were protesting a Chicago newspaper's depiction of St. Patrick, which was a non-caricature based on an old wood engraving. This came a few days after an unidentified group of Christians (denominations unknown) burned a variety of Middle East nations' flags in Golden Gate Park. Thousands marched through the park, demanding an apology for major world newspapers' Christmastime images of baby Jesus, which the Christians said were "insulting" and "offensive." The protestors also demanded that Saudi Arabia release a dozen American and British political prisoners, who had been imprisoned for participating in a Bible study at one of their private homes in Riyadh. And just this morning, a dozen heavily armed Jews marched from Brooklyn to lower Manhattan, where they surrounded the New York Stock Exchange. After taking up sniper-like positions along Wall Street, one read a statement that threatened to search downtown apartments and kidnap any Middle Eastern foreigners. The basis for their protests is a drawing of Abraham in a Christian group's recently published children's book of Bible stories, which the Jews charge is blasphemy. If you substitute "Palestinian terrorist gunmen" for any mention of Christians and Jews, and change the locations appropriately, you have accurate accounts of what Muslim "protestors" have been doing. It's being reported in the news, but quite quietly. And why are the "Muslim protestors" doing this? Because a Danish newspaper republished some illustrations of Mohammed, a few of which were political cartoons. Granted, not all of them are the nicest depictions, but as Voltaire said, "I disagree with what you say, but I will defend to the death your right to say it." However, this is a "freedom of speech" issue only on the surface. Most fundamentally, it shows how tolerant the most "vocal" Muslims really are, and the kind of society Islam envisions. I've been so swamped lately and haven't been able to scour news and blogs for this, but I have yet to hear that any peaceful Muslim organizations in the U.S. and Canada have condemned the violent protests. They should, if they truly want to show that the violent thugs are only a "radical fringe" and "not representative of true Islam." Their silence can be quite telling about whether they are sincere or merely giving lip-service to "peace." "Thinkest thou that I cannot now pray to my Father, and he shall presently give me more than twelve legions of angels?" On the other hand, what do these "protesting" Muslims think they are doing for their religion's image when they must "defend" Mohammed with such violence? They may especially hate the cartoon showing Mohammed's bomb turban, but their actions make it the accurate representation of their radicalism. And how many of them, like gang members taking advantage of the first Rodney King trial to pillage Los Angeles, are using the cartoons as an excuse to continue the pattern of violent thuggery we've come to expect? And then mainstream media unreports the violence. The headline calls the latest hostage taking a "protest," with the article title describing the terrorist gunmen as "angry." Well, I can get angry too, but I don't go around with friends, carrying high-powered weaponry to take over offices and threatening to kidnap people. 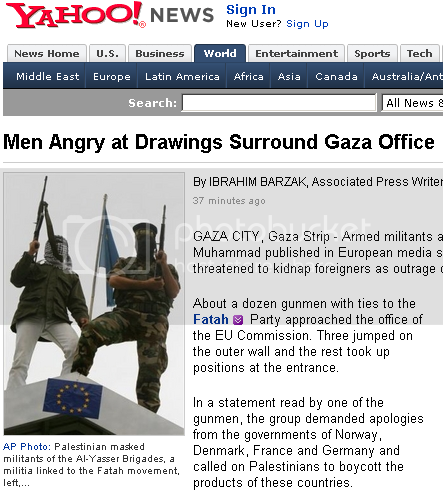 Note that the are from Fatah, not even Hamas! There's not a dime's worth of difference between the two, except that the latter isn't silently about terrorism and the destruction of Israel. In Paris, the daily newspaper France Soir fired its managing editor after it republished the caricatures Wednesday, and Pakistani protesters chanting "Death to France!" France Soir and several other European papers reprinted the pictures in a show of solidarity with the Danish daily. The poorly phrased wording implies the managing editor was fired because France Soir republished the images, but I suspect he was fired for disagreeing with the decision. Update: from our friend Rusty Shackleford at My Pet Jawa, I learned that France Soir did in fact fire its managing editor for republishing the images. Sheesh. I really liked the first comment: "Note that the French were the first to surrender (again)." To Muslim organizations in the West that claim to love peace and shun violence, yet are silent on the protests: are these additional images you want non-Muslim Westerners to associate with Islam? Never mind Zarqawi, Zawahiri and Osama. When "mainstream" Muslim groups in the UK talk about installing caliphates across the West, non-Muslim Westerners add that to a long list of not-so-nice things and people they can't help but associate with Islam and its adherents: planes flying into the World Trade Center, Daniel Pearl and Nick Berg. "You are not to inquire how your trade may be increased, nor how you are to become a great and powerful people, but how your liberties can be secured; for liberty ought to be the direct end of your government." "One can never be too hard on France." Will someone tell Paul Krugman to avoid labor econ? What do you call a disarmed populace? What to do about the price of gasoline? How many lies can Ted Rall make in one cartoon? Wal-Mart and "separation of commerce and bank"
Saving us from foreign oil "dependence"? What hath the free market wrought? Is limited government in accordance with the Bible? The Democrats' myth of "energy independence"
How much do you "deserve" in pay? So you wanna revalue the yuan? Eminent domain: "The law perverted!" Will Krugman eventually be right? Where does the Constitution give courts the right? Star Wars: "The Jedi are not to be trusted"? Are we becoming a service economy? Give more back to the government? "Entitled" to other people's money? Iran: it's all your fault, you made us do it! Eating the rich? Or just soaking them? All original content of the Eidelblog is © 2005-2008 by Perry R. Eidelbus. All rights reserved.